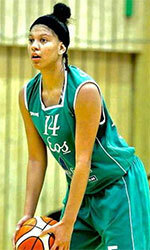 Basquete Blumenau (LBF) added to their roster 25-year old Venezuelan international guard Waleska Perez (181-94, college: Weatherford JC). It is actually her comeback to Blumenau as she has played here before. Perez played last summer at Obras Basket in Argentinian LaLiga. In 11 games she recorded 7.9ppg, 3.5rpg, 2.5apg and 1.3spg. The last season Perez played at Basquete Blumenau where in 16 games she averaged 13.4ppg, 7.4rpg, 4.2apg and 2.8spg (in top 4). She helped them to make it to the semifinals. A very spectacular season in her career as she was voted to Latinbasket.com All-Brazilian LBF Honorable Mention and League Player of the Week. Perez has been also a member of Venezuelan international program for some years. 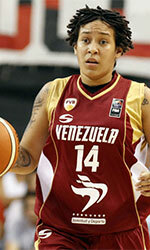 She has regularly played for Venezuelan senior team since 2010 and previously for U18 National Team in 2009. Perez represented Venezuela at the South American Championships in Tunja (Colombia) last year. Her stats at that event were 5 games: 5.6ppg, 3.8rpg, Assists-3 (5.0apg), 1.6spg, FGP: 13.3%, 3PT: 31.8%, FT: 75.0%. Perez has played previously professionally in Spain (Arxil Pontevedra) and Venezuela (Anzoategui, Guaras and Cangrejas). She attended Weatherford College until 2014 and it will be her fifth season as a professional player. Kotka Peli-Karhut (Korisliiga) inked 23-year old Venezuelan international small forward Daniela Wallen (180-95, college: Oklahoma City). She played in the summer at Sol de America Asuncion in Paraguayan Metropolitan League. Wallen managed to play in three leagues in three countries last year (!!!). She also played for Geelong Supercats (SEABL) in Australian league where in 18 games she averaged 12.3ppg, 6.8rpg, 1.9apg and 2.4spg. Wallen won NAIA D1 championship title in 2017. She has been also a member of Venezuelan international program for some years. Wallen has regularly played for Venezuelan senior team since 2013 and previously for U16 National Team back in 2011. She represented Venezuela at the South American Championships in Tunja (Colombia) last year. Her stats at that event were 5 games: Score-4 (17.4ppg), 6.8rpg, 2.4apg, 1.6spg, FGP: 58.8%, 3PT: 40.7%, FT: 66.7%. Wallen has played also professionally in Sweden (IK Eos). She attended Oklahoma City University until 2017 and it will be her second season in pro basketball.